The weather forecasts unanimously agreed. The cold front that had just passed through would end with a whimper, the winds veering and dropping from 25 knots to 15. They already were. Perfect. I popped open a cold one to toast another laid-back Exumas sunset. That’s when I spotted the cloud. It seemed to suddenly just be there, stretching across the northwest horizon: long, low and very dark. It came racing down the channel, swept over our mastheads and delivered its first punch, which was followed by a steady shove that kept getting stronger—and stronger. Darkness descended like a hammer and just like that, wham! We were engulfed in a slam dunk Force 11 storm blowing 50- to 70-knots sustained and gusting up to lord knows how high. Silverheels reeled as I scrambled to secure anything loose I could lay my hands on, adrenaline pumping. The wind howled, and the whole boat moaned, but the anchor held, which was more than I could say for some of my neighbors. Through flying spray I could make out the 38ft cutter to port rearing up like an angry bronco, leaping halfway out of the water over the steep, breaking seas that were already cascading down the channel, and it occurred to me my boat probably looked like that to them. Yikes! The cutter stayed put, but a catamaran behind us dragged away into the murk. Luckily, her hook dug itself back in after a couple of hundred yards, and she rode out the rest of the storm in place. Others, I later learned, were not so fortunate. Punctuating the excitement was a two-story motoryacht dragging through the anchorage over and over. Each time, its captain powered back to windward and tried (in vain, obviously) to set his undersized anchor, after which it would drag through the fleet again. Several times that million-dollar monolith nearly slammed into my nearest neighbor, a cruising family with two kids on board, who were a little farther out into the channel than I. One time I glimpsed the young father on his foredeck, streaming out fathoms of anchor rode hand over fist, and then driving his boat sideways just in time to evade the oncoming behemoth, all this in full storm conditions. The tactic worked, and the big vessel careened in between us, broadside and out of control, narrowly missing both sailboats. Silverheels was one of a dozen boats anchored in this shallow, mile-long channel between two islands. It was a decent place to ride out the moderate breezes weather forecasters had predicted for the passing front, but not so good for the rogue storm that was now roaring unabated down the full length of it. The wind alone would’ve kicked up a wicked chop in there, but a strong tidal current was running up-channel against it, and the combination generated absurdly high, close-packed, steep-walled seas that broke continually. Silverheels carries a 66lb Manta anchor that remained snug in the sand bottom 85ft out and 10ft down. The rode is all ⅜in high-test chain, with a ⅝in nylon snubber picking up the strain 10ft off the bow and transferring it via a stout stem U-bolt to a foredeck cleat. It was a strong, functional setup that had never failed me—until that evening. As the storm raged it grew chilly on deck, so I ducked below to grab a jacket. That chance timing probably saved my boat because down there I heard what I would never have noticed out in the cacophonous cockpit: a succession of clattering rumbles emanating from the bow. Whatever it was, it wasn’t good. Flashlight in hand and keeping low, I half-crawled forward along the side deck to investigate. The racket turned out to be my anchor chain streaming out through the windlass gypsy. The snubber had parted, snapped in two! It was my own fault. The stressed, sunburned line was nearly two years old and should’ve been replaced long before. Its failure put the full strain of the anchor chain directly onto the windlass—13 tons of tugging, yawing, bucking boat in this crazy storm-force wind from out of nowhere—and the windlass chain gypsy’s brake wasn’t set tightly enough, or simply wasn’t strong enough, to hold against such violent strain. With each cresting sea, the chain rattled out another 6ft or 8ft, then paused in the trough, then ran out some more. As I watched, the last of the 150ft of chain flew overboard, pulling behind it the first yards of spliced ⅝in line that made up the final 100ft of the anchor rode. At the end of that line was a stopper block that might or might not shatter when it slammed up against the underside of the chain locker deck pipe. Beyond that...well, I wasn’t going beyond that. Reluctant to tighten the gypsy brake and put all that jerking force directly onto the windlass, I scurried aft, grabbed a short, thick dock line from the rope locker and clawed my way forward again. No telling by then how much of the anchor line had run out or how much was left, but it was still slipping in bursts. 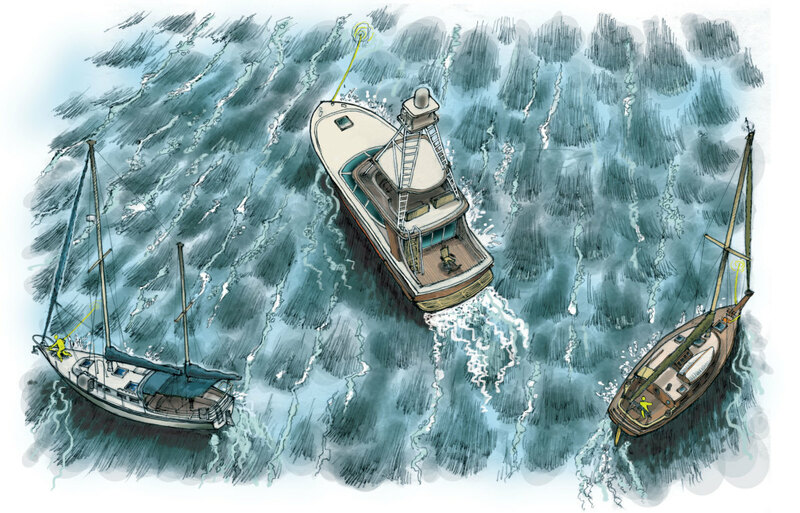 In between two of them I attached the dock line to the rode with a five-turn rolling hitch, muttering curses and prayers the whole time that I couldn’t hear over that blasted wind. No sooner had I cinched the knot than it was torn away from me, taking half the dock line with it as the rode streamed out another fathom. Another pause. Frantically I rove the bitter end through a bow chock, figure-eighted the few remaining feet onto a sturdy deck cleat, and with the next surge, the line yanked tight as a bow string—and held! A simple feat, sure, but up there on that leaping foredeck in the black of night in a near-hurricane you could say it had gotten my full attention. I stood anchor watch at the helm for the remainder of the blow, high-idling the engine in forward most of the time to ease some of the strain on the ground tackle, accelerating in the gusts and steering to counter the more dramatic yaws. Belatedly, a hard rain arrived and beat down the wave crests a bit, even as stroboscopic lightning continued to illuminate a chaotic scene of hulls and masts visually frozen at insanely incongruous angles. Ultimately, the blow lasted more than an hour, finally easing off to a mere 40 or 50 knots, then gradually settling to 30, 20 and at last, as originally forecast, a nearly silent 15. Only then could I hear the VHF radio lamenting the numerous dragged and damaged boats in the vicinity. The next morning revealed much more throughout the lower Bahamas, including at least one total loss. Lots of cushions and a few dinghies were missing, but no one was hurt that I know of. Someone with an anemometer claimed a peak reading of 92 knots. I expect everyone learned something that night. I sure did, and as a result, I’ve added one final step to my anchoring routine (in addition to obtaining a new snubber line and putting an unbreakable line stopper on the anchor rode’s bitter end). It only takes a moment, and I sleep better for it. Specifically, I also now keep a short length of dock line permanently cleated on the foredeck. The last thing I do once I’m anchored is tie it through a chain link with a bowline, between the windlass and the bow roller, as a back-up preventer—just in case the anchor rode ever decides to go for another evening run.